In anime movie A Silent Voice, deaf girl Shoko Nishimiya’s sixth-grade notebook is full of apologies to the classmates who keep throwing her hearing aids in the river. Her bullies’ ringleader, Shoya Ishida, later watches his guilt-ridden mother offer $15,000 dollars to Nishimiya’s mother in compensation. The cycle of hurt continues until it reveals itself to Ishida, who decides to break it. There is a law of equal exchange in A Silent Voice that isn’t physical or karmic as much as empathic. Nishimiya’s mother slaps Ishida’s after the money is exchanged. In high school, Ishida is ostracized for bullying that, years ago, seemed sanctioned by the norm of children’s callousness. Everyone in A Silent Voice gets what’s due to them. Watching it hurts like holding a long, difficult stretch, but its startlingly good animation and strong pacing make it wholly pleasurable to watch. A Silent Voice, which has won a half dozen “anime of the year” awards overseas, will be out in U.S. theaters this October. It follows high-school Ishida who, equipped with a knowledge of sign language and the weight of his guilt, pursues a friendship with Nishimiya after the pain he inflicted on her in their childhood years. A Silent Voice offers no unblemished characters. Orbiting Ishida and Nishimiya are their current and former classmates, the coward Miyoko Sahara, the ruthless Naoka Ueno, the desperate Tomohiro Nagatsuka and the vain Miki Kawai. With them, a veneer of self-assurance is always present, except in Ishida, who feels nothing but regret for how he treated the deaf girl in elementary school. Of course, inside, everybody hates themselves (or others in an effort to self-preserve), a fact that never presents itself to Ishida, who chooses to spend his early adolescence isolated and paying for his sins. Until he stops self-flagellating and allows in others’ friendship, he suffers because he doesn’t understand the meaning of empathy or know whether he deserves it. A Silent Voice depicts the cruelty people with disabilities can face and how unselfconsciously children can act out when they don’t understand something. Nishimiya’s life never looks easy. Her strained smile and constant apologies prevent anyone from getting to know her, which frustrates her former classmates. They feel forced to accommodate Nishimiya’s differences and don’t want to do the work without her authentic personality as pay-off. 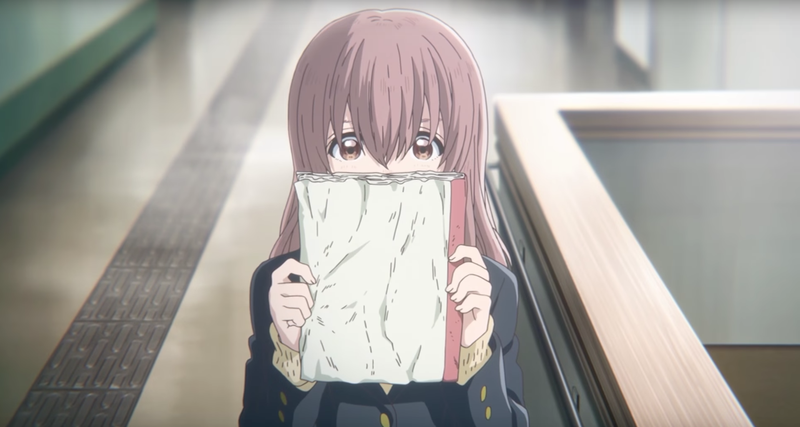 Because Nishimiya tries hard to make things comfortable for them, offering her notebook for communication or refusing to stand up for herself, A Silent Voice often lulls viewers into thinking this inherent tension is on the brink of being released. Harsher moments, like when others criticize her out-of-tune speaking or when her sign language is simply not dubbed, jerk viewers out of that mindset. The movie’s score, a groggily cheerful piano track by composer Kensuke Ushio, is always tender and sweet, offsetting some of the movie’s harsher moments, like one of the most stunning animation sequences I’ve ever seen: flashing from an egg yolk splashing around a bowl to Ishida’s mother with a stack of pancakes to a burst of fireworks, and ending with peaceful, swimming carps and, finally, bright lights that tease at a headache (it fits the mood). A Silent Voice lacks nothing in appearances. This is a movie that will stretch your sensibilities, and while it is certainly a plunge into darkness, its exceptional plot and animation makes watching it like eating fistfulls of candy vitamins.